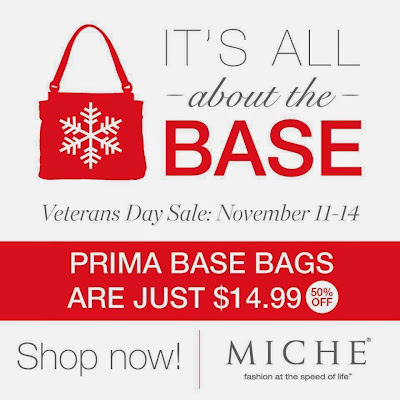 Get your Prima Base Bag 50% off ONLY $14.99!!! Get a head start on your holiday shopping with this great deal. Go to Unique Stylish Purses to see all the current Miche products and shells available. Be the 1st to Know What's New! It's a "Base Bag" with changeable exterior "Shells" -- no need to move your belongings from one purse to another when you want a different look...just change the Shell in about 3 seconds! New styles are released every month, so come back and visit often! Once my children were grown and gone, I was laid off from a big corpration after 14 years of service in Illinois. I packed up everything and moved to California to work for my sister at Announcingit.com. She had bought a Miche purse a few years ago and I was absolutely blown away by these amazing and unique handbags! I signed up to become an Independent Miche Representative, and it was one of the best decisions I've ever made. As a Representative I have made lots of new friends, am helping to pay for bills and vacations, and - best of all - am having so much FUN every day! I'd love to have you join my Team! Contact me about having a party and earn fabulous, exclusive hostess shells. Join our Team Today! Click and see what you get in your kit to start making money today!